Saraburi (Thai: ) is one of the central provinces (changwat) of Thailand. Neighboring provinces are (from north clockwise) Lopburi, Nakhon Ratchasima, Nakhon Nayok, Pathum Thani, and Ayutthaya. Saraburi has been an important town since ancient times. It is believed to have been constructed in the year 1548 during the reign of King Maha Chakkraphat of Ayutthaya as a centre for recruiting troops. Saraburi is on the east side of the Chao Phraya river valley. The eastern part of the province is covered by high plains and plateaus, while the western part is mostly low flat plains. Two national parks are located in the province. 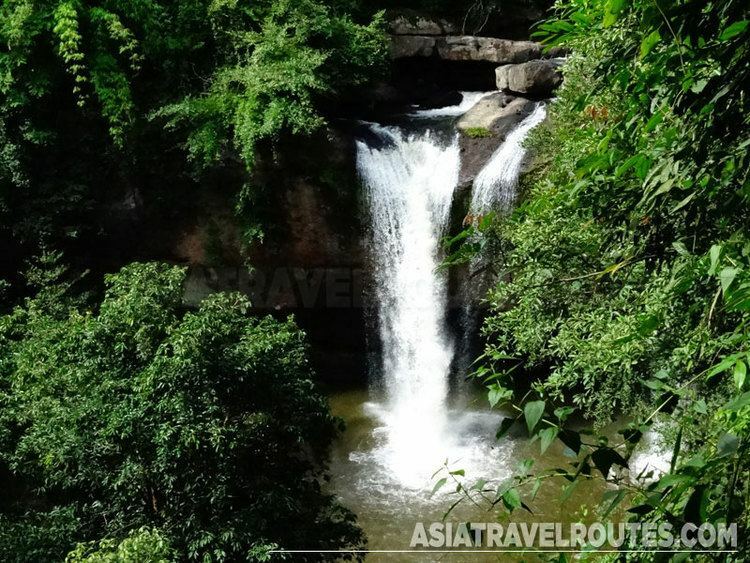 Namtok Chet Sao Noi protects 28 km² around a scenic waterfall. Phra Puttachai protects the Khao Sam Lan Forest, which consists of hilly landscape and is the source to several rivers and waterfalls. The highest elevation is the Khao Khrok at 329 m. The 44.57 km² were declared a national park in 1981. The town, as a gateway to the northeastern region, is 108 km from Bangkok. It occupies an area of 3,577 square kilometres. Saraburi has been an important city since ancient times. It is assumed to have been established approximately in 1549 during the reign of King Maha Chakkraphat of the Kingdom of Ayutthaya. It is assumed that the king had ordered to combine some parts of Lopburi and Nakhon Nayok together and set up Saraburi Province with the aim of mobilizing citizens during times of war. Therefore, from the Ayutthaya period, the story of Saraburi has usually related to battles and wars. As for the origin of the word "Saraburi", it is assumed that due to its location near a swamp called "Bueng Nong Ngong", when the town was established a combination of "Sa" ("swamp") and "buri" ("town") was suggested and the town was named "Saraburi". In 2007, Saraburis population was 89.34% Buddhist, 597,138 persons. There are 499 temples. There are total of 3,443 monks and 274 neophytes. 953 people are Muslims (0.32%). There are five Christian churches. Phra Phutthabat Temple: This temple is in Amphoe Phra Phutthabat, 28 km north of the town along Highway 1. It is one of the most beautiful religious sites in Thailand. The temple houses the footprint of Lord Buddha found on a stone panel near Suwan Banpot Hill. The footprint was found in the reign of King Songtham of Ayutthaya. A spired square pavilion or mondop was built to cover the footprint. Khao Sam Lan National Park: The nearest national park to Bangkok. It is 4 km beyond Wat Phra Phutthachai. The park offers many small waterfalls, some of which can be reached by short hiking trails. The best time to visit the falls is the late rainy season when water is plentiful. Crocodile Farm and Zoo (??????????? ??????????? ): Besides crocodiles, there are many other kinds of animals such as deer, monkeys, and various species of birds. Phra Phuttha Nirarokhantarai Chaiwat Chaturathit (?????????????????????????????????? ): It is the Buddha image of the East and one of the four images made by the Territorial Defence Department to express loyalty to King Rama VI and King Rama IX. It resides in the cruciform pavilion of Wat Sala Daeng. Phu Khae Botanical Garden (???????????????????? (???? ): Established in 1941 as the first Royal Forest Department Botanical garden, it sprawls over an area of 300 ha of which 100 ha is natural vegetation and forest. It also features a literary garden, comprising 35 species of plants which are mentioned in Thai literature. It also contains a medicinal garden. Tham Si Wilai (?????????? ): A cave in which resides the Phra Phutthanaowarat Buddha image from the Chiang Saen period. The cave also features stalagmites and stalactites. Sao Ronghai (?????????? ): A gigantic post made from a hardwood tree known as Takhian, which is believed to possess a female spirit called "Takhian Thong". This post was submerged under water at this sub-district for more than 100 years until in 1958, the locals brought it out of the water and kept it in the shrine. The Golden Buddha Image (??????????????? ): A Buddha image in the meditation posture. The Fine Arts Department examined it and analysed that it is 70% gold. Therefore, the locals named it "Luangpho Thongkham", the "Golden Buddha image". Wat Phayao (?????????? ): The golden Buddha image of Wat Phayao is considered as one of the major sculptures of Ayutthaya period. The believers built a viharn with a cruciform plan as a residence for the Buddha image to enhance its dignity and to bring honour to the people of Saraburi. Wat Khao Kaeo Worawihan (?????????????????) When King Rama IV visited Sao Hai District, he ordered the renovation of this temple and promoted it as a royal temple. There has been a rumor that a bright crystal ball would appear over the viharn of Wat Khao Khaeo on some nights. Ban Khao Kaeo (??????????? ): A traditional Thai wooden house approximately 80–100 years old. It is the property of Achan Songchai Wannakun. The house was established as the "Thai Yuan Cultural Study Centre", collecting folk utensils, weapons, present day tools as well as ancient woven textiles of over 100 years old. Bencha Sutthi Khongkha (?????????????) refers to the sacred water from one of the five important rivers that flow through Sao Hai District. It is used for the Oath of Allegiance ceremony ever since the reign of King Rama IV to the present. Wat Samuha Pradittharam (?????????????????? ): Inside this temple one can find beautiful murals depicting the Khawi folk tale. The main Buddha image, in the posture of subduing Mara, was taken from Sukhothai’s Ancient City. It is cast in bronze and covered with gold leaf. Wat Chanthaburi (??????????? ): The main attraction is the ubosoth, constructed in 1893 during the reign of King Rama III. Inside are beautiful murals of the same period as the ubosot. They are still in perfect condition and depict the gathering of angels and the story of the Lord Buddha. Weaving Centre of Tambon Ban Ton Tan (??????????????????????????????????? ): This centre is an educational facility for the youth and general public. There are various kinds of woven fabric on display such as loincloth, plain coloured cloth, Pha Si Khao, and fabric in the Dok Phikun – bullet wood flower – pattern, which is a traditional Thai Yuan style. Thanon Phrachao Songtham or Thanon Farang Song Klong (????????????????? ???? ????????????????? ): A road constructed during the reign of King Songtham who reigned from 1611 to 1628. At present, approximately 9 kilometres of the path can still be seen. It starts opposite Wat Sang Sok. It was changed into a laterite and concrete road with a width of 6–8 metres. Thale Ban Mo (??????????? ): A deep and wide pond with a serene atmosphere, it is the habitat of various water creatures. From February until July, large flocks of migratory birds from Siberia can be found here. Samnak Song Tham Krabok (?????????????????? ): A well-known rehabilitation centre for drug addicts. This monastic residence was established by a Buddhist nun, Mian Panchan, in 1957. Bo Phran Lang Nuea (???????????????? ): A small stone well near Wat Phra Phutthabat. At the mouth of the well are knee prints. There are stone slopes and a deep hole the size of a can of milk near the well. The water that flows from the hole is believed to be holy water. Phra Tamnak Than Kasem (???????????????? ): This palace was built in 1633 during the reign of King Prasat Thong as his residence on his royal visit to pay respect to Phra Phutthabat. The base of the palace still remains. Tham Thep Nimit Than Thong Daeng (????????????????????? ): It is a prehistoric archaeological site. Artefacts of the late Neolithic period were discovered here. Tham Narai or Tham Khao Wong (?????????? ???????????? ): It is a cave containing stalagmites and stalactites as well as ancient Mon scripts at the entrance of the cave. Tamnak Sa Yo (??????????? ): A royal residence constructed at the edge of Than Thong Daeng by Somdet Phrachao Prasat Thongs command for his visit to pay respect to Phra Phutthabat. Phra Tamnak Thai Phikun, the Ancient Palace (?????????????????? ??????????????) In the present, there are no remains left of the actual palace. Only the royal elephant mounting platform and the surrounding wall are left. Tham Phrathat Charoen Tham or Tham Bo Pla (??????????????????? ????????????? ): The cave is divided into 3 big rooms. In the cave resides Luangpho Yai, a stucco Buddha image with black lacquer applied and covered with gold leaf in the gesture of subduing Mara. It is from the Ayutthaya period. Pha Sadet (???????) It is the cliff where King Rama V and the Queen resided when the Bangkok – Nakhon Ratchasima railway was constructed in 1895. Both of them also inscribed their royal initials, Cho Pho Ro and So Pho at the cliff. Tham Phra Phothisat (??????????????? ): A bas-relief from the Dvaravati period can be found on the cave wall, depicting the preaching Buddha as well as Hindu gods. Outside the cave are many trees of various kinds as well as the royal initials, Cho Pho Ro, inscribed by King Rama V when he visited the waterfall. It consists of Tham Thammathat, Tham Lumphini, a stone garden and Tham Sa-ngat Chedi. Khao Phra Phutthabat Noi (??????????????????) features undulating steep limestone mountains with many pointed summits. Inside lies a replica of the Buddha’s footprint, around 1 cubit wide and 3 cubits long imprinted deep into the ground. Phra Bowon Ratchawang Si Tha (???????????????? ): The compound of this residence was very large, covering an area of approximately more than 150 rai. There still remains the lotus base for a wooden house made of brick and cement. There is an area of around 4 rai left which the Kamnan - village headman, Mr. Suphat Ritthichampha, has reserved as a public area. Ban Dong Nam Bo Archaeological Site (????????????????????????? ): It is a cemetery where burial ceremonies were conducted and an archaeological site of the Pa Sak River culture. Also, iron and stone tools, jewellery, bangles and beads, aged approximately 2,000 years, were discovered. Chet Khot - Pong Kon Sao Nature and Ecotourism Study Centre (??????????????????????????????????????????????-???????????? ): The centre features a large biodiversity of both plants and animals. It comprises many kinds of forests such as dry evergreen forest, moist evergreen forest, mixed deciduous forest and savanna. Animals living in this compound are wild elephants, gaurs, bears, deer, barking deer, lories, mouse deer, wild boar and approximately 158 kinds of birds. Nature Study Routes (???????????????????? ): There are three overall. The first route is from the sightseeing spot 12 kilometres from the centre. The second route is from Sap Pa Wan Reservoir to Hin Dat Waterfall. The third route is from Sap Pa Wan Reservoir to Namtok Chet Khot Nuea, Klang and Tai. Other waterfalls are found in the area. Significant are the Namtok Khao Khaep, the Namtok Krok Fa Phanang and the Namtok Sap Pa Wan. Sekeikyuseikyo Thai Headquarters (????????????????????????????????????????) lies the tropical Miroku Botanic Garden. There is also a pool, marble sculptures in various shapes, and a Japanese garden with. On the other side of the project lies an organic demonstration vegetable plot by using the Effective Microorganisms (EM) technology: a use of a micro-organism to reduce pollution in the environment. Rafting along the Pa Sak River (??????????????????? ): The mountains line up along the rafting route. At some parts stones and cliffs can be seen with strange shapes, similar to animals. Namtok Heo Noi (???????????? ): Proceeding further from this waterfall, there are high waterfalls in Khao Yai National Park. The best time to visit is from July to November. Muak Lek Arboretum (???????????????????) and Namtok Muak Lek (????????????? ): The lively stream originates from its tributaries in the Khao Yai National Park that flow into the Pa Sak River which forms the border between two provinces. The stream has rocky slopes that form small beautiful cascades. Namtok Chet Sao Noi National Park (??????????????????????????????) The waterfall has seven levels. The height of each level is approximately four metres and has a spacious shaded swimming area. Namtok Sap Heo (??????????? ): This waterfall has a large basin for swimming. On the right side of the waterfall is a path to a small cave which houses stalagmites and stalactites. Trekking to the waterfall is quite difficult. Tham Dao Khao Kaeo (????????????? ): The distinguishing points of this cave are its red, black and brown spots on the ceiling as well as the stalagmites and stalactites and its large population of bats. The Dairy Farming Promotion Organisation of Thailand (?????????????????????????????????????? (?.?.?. )): The Danish government and the Danish Dairy Farming Association together offered a promotion project on the raising of dairy cows. They cooperated with the Thai government to establish the Thai-Danish Dairy Farm (TDDF) and a training centre in Muak Lek District, Saraburi. Pa Sak Jolasid Dam (???????????????????? ): It was selected as one of the "Unseen Thailand Destinations". It is the longest earth filled dam in Thailand with a length of 4,860 metres along the crest. Tree Tunnel (?????????????) is an arch formed by trees bent towards each other on both sides of the road, forming a 200-metre long shaded "tree tunnel". Sunflower Fields (????????????) are found between Lopburi and Saraburi along the Phatthana Nikhom – Wang Muang route. From November to December, the yellow sunflower fields along the road attract many people. Chedi Phrakhun Mae (??????????????? ): The chedi is surrounded by Buddha images representing the seven days of the week. It was constructed to encourage children to remember the kindness of their mothers and to be good in return. Phai Tam Sub-district Bird Garden (??????????????????????? ): The garden covers an area of approximately 3 rai and is the residence of more than 17 species of birds. These birds always find their food early in the morning and fly back to their nest at dusk. The National Dairy Cow Festival (???????????????) is organized in the Muak Lek District in January every year. H.R.H. Princess Maha Chakri Sirindhorn is the chairperson for the opening ceremony. It is the biggest event in Thailand for professional dairy cow farmers. The Phra Phutthabat Homage Paying Fair (???????????????????????) is held twice a year: starting on the first day of the waxing moon and continuing for 15 days until the full moon day in the third lunar month; and from the eighth day of the waxing moon, continuing for eight days until the full moon day in the fourth lunar month. The Kam Fa Festival (????????????) is held on the second day of the waxing moon in the third lunar month. The eve of the festival features various forms of folk entertainment and activities including cockfighting and toasting sticky rice in bamboo. The Kam Fa Festival occurs on the third day of the waxing moon in the third lunar month. People perform merit making and attend sermons. The festival takes place annually at Phai Lio Sub-district, Don Phut District. The Wat Sung Songkran Festival and Sao Nang Takhian Bathing (????????????????????????????????????????) is held annually on 23 April in front of Wat Sung’s ordination hall, Sao Hai District. People perform merit making ceremonies and pour water onto elders and onto the Nang Takhian pillar. Hae Phra Khiao Kaeo (??????????????????????? ): Buddhists believe that Phra Khiao Kaeo was the tooth of the Lord Buddha. A festival is held on the first day of the waxing moon in the fourth lunar month. The people of Amphoe Phra Phutthabat take the tooth from Wat Phra Phutthabat Ratchaworamahawihan Museum and carry it in a procession around the town. They believe that if the procession is held, they will live in wealth and happiness. It is an annual tradition of Phra Phutthabat District. The Chaopho Khao Tok Fair or Chaopho Khao Tok Procession (??????????????????? ???? ??????????????????) is held at Wat Phra Phutthabat Ratchaworamahawihan, Phra Phutthabat District, and is an annual fair. The event features supernatural power performances of Chaopho Khao Tok such as fire walking. There is also the Lo Ko dragon parade and Chinese opera performances. Mainly Chinese people, especially the followers of Chaopho Khao Tok, come from all over the country to celebrate this festival. The event begins on the first day of the waxing moon in the fourth lunar month, and continues for four days. The Tak Bat Dok Mai Ceremony (????????????????????) is considered a significant tradition of Phra Phutthabat District. This merit-making ceremony is held to coincide with the start of the annual three-month Buddhist Lent on the first day of the waning moon of the eighth lunar month. 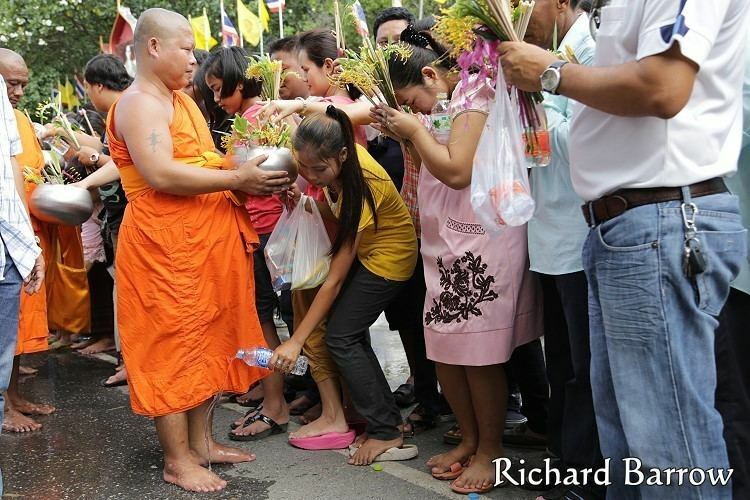 During the ceremony, people offer alms to monks and candles to Wat Phra Phutthabat, early in the morning. In the afternoon, they offer flowers to the monks at Wat Phra Phutthabat Ratchaworamahawihan, Khun Khlon Sub-district, Phra Phutthabat District. They go to collect a kind of flower similar to Krachai (Rotunda) or turmeric with yellow or white flowers called “The Flower of Buddhist Lent”. This herb-like flower is found on the hillside only during the Buddhist Lent period and only in Saraburi. While the monks are walking up the staircase to take the flowers to pay homage to the Lord Buddha’s footprint, people wait along the steps with bowls of clean water in which are floated bullet wood flowers. They pour the water onto the feet of the monks as a means of washing away their sins. The Flower of Buddhist Lent was listed as a new species of plant in the world in the International Flowers Fair in July 2001 at Jurong Bird Park in Singapore. 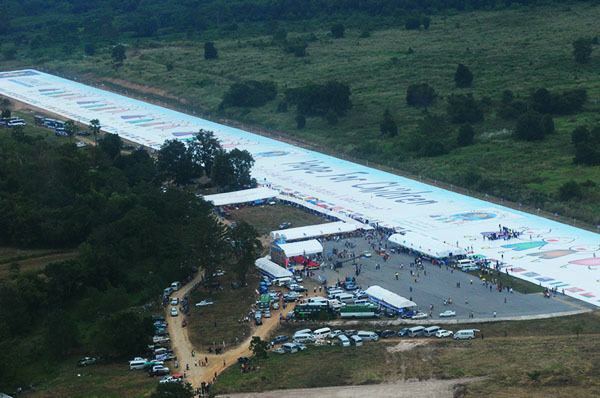 The Pa Sak Boat Racing Festival (?????????????????????????????????????) is a major annual regatta that takes place at the pier in front of the Sao Hai District Office on the last Saturday or Sunday of September. Famous long boats from all over the country join in the race. There are four categories: boats with 55 paddlers, 30 paddlers, 12 paddlers, and 10 paddlers. This festival is a way to preserve the local tradition.